Village of Rochester Hills Halloween 2018 – Date, hours, time, and entertainment schedule for the annual Halloween event at the Village of Rochester Hills this October! This year’s Village of Rochester Halloween event, AKA Halloween at the Village, is Sunday, October 28, 2018 from 3p-5p. This is a family event that helps feed those less fortunate in our immediate area. It is all about “neighbors helping neighbors” as The Village of Rochester Hills helps raise money and gather food for our local families in need! 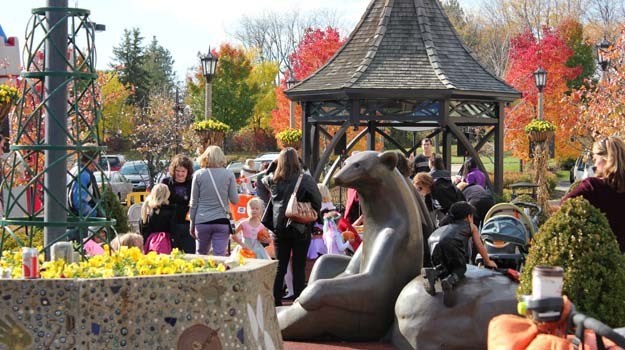 Join Oakland County Moms at The Village of Rochester Hills for their annual Halloween event! Cost is $5 or 5 non-perishable items to donate to the less fortunate. 100% of this year’s proceeds will go to Blessings in Backpack. Admission to Village of Rochester Hills Halloween 2018 Halloween at the Village event is $5 or 5 non-perishable items. Remember, costumes are not mandatory for the event but highly recommended. The Village of Rochester Hills is located at the NE corner of Walton Rd and Adams Rd in Rochester Hills, MI.